She has sold over three million workout videos. Her nationwide seminars attract crowds of 1,500 plus. Her website receives more than 90,000 hits a day, mostly from T-Tappers who support one another through thick and thin–literally. Yet, despite this phenomenal success, chances are that you haven’t heard of Teresa Tapp, creator of the revolutionary T-Tapp fitness program. That’s about to change. T-Tapp is the most efficient and effective workout you’ll ever do. It requires no equipment, no weights, and no bands. There is no jumping to stress your joints. Everyone gets results regardless of fitness level and you never need to do more than eight repetitions of any movement. 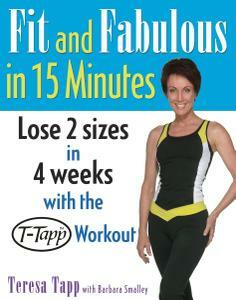 T-Tapp reshapes your body while it fires up your metabolism so that it burns fat faster. All you need is four square feet of space and just 15 to 45 minutes a day in order to see a dramatic loss of inches. Most T-Tappers see results within seven days. How does this happen? T-Tapp’s unique sequence of comprehensive, compound muscle movements work the muscles layer by layer, from the inside out, to cinch in, tighten, tone, and burn fat better. Recent medical studies even show that T-Tapp improves blood-sugar levels in type 2 diabetics. Plus, the no-impact workout is safe for those with shoulder, hip, knee, neck, and back concerns–it may even alleviate chronic pain. Additionally, T-Tapp is effective as a wellness workout for such conditions as arthritis, fibromyalgia, lupus, chronic fatigue syndrome, and multiple sclerosis. So with T-Tapp you build a better body–inside and out. Completely illustrated with step-by-step photographs that show how to do the exercises, as well as incredible before-and-after photographs, many in full color, of real-life T-Tappers, Fit and Fabulous in 15 Minutes also includes inspiring testimonials and an easy-to-follow food plan that lets you eat the food you love without guilt or ever going hungry. If you want real results–real fast–tap into the power of T-Tapp!